Gacoli Monroe No. 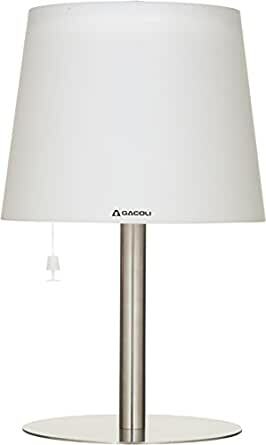 2 Outdoor Table Lamps come with an attractive flat stainless steel base and a short shade that is perfect for casting a beautiful warm white light. This all-weather table lamp comes with a remote control and a dimmer switch. The automatic twilight switch means the light will automatically turn off.